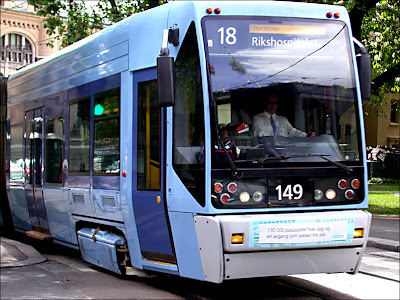 This is a "trikk", which is the Norwegian name for trolley/tram. 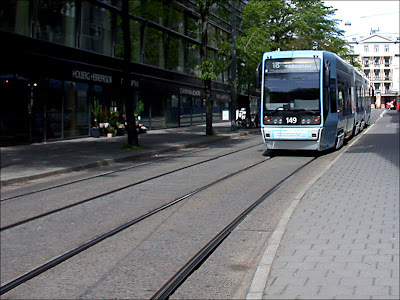 There are several in Oslo, mostly in the central area. They come in different types and colours, this one is quite modern compared to the old blue ones I remember from my childhood. We also have a subway system, and of course a lot of busses and trains. It looks clean and I especially like the color. Great shots! Thanks for visiting and commenting. I'll continue to look for the old "trikk". Hopefully, there are some still running. You didn't mess up, not bad at all. Just add an "e" after "bilden" and you're 100 % correct.